On March 21, 1967, Governor Dan Evans signed legislation that established The Evergreen State College. 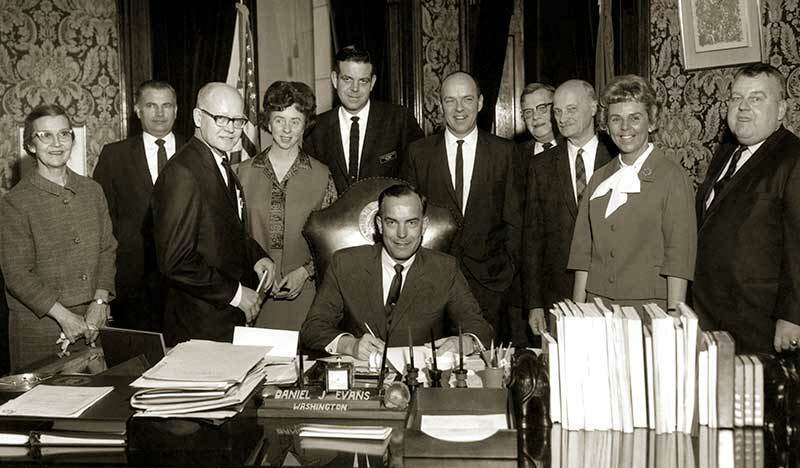 This March 21 at the Legislature’s State Reception Room 50 years later, Evergreen celebrated its founding day. Governor Jay Inslee and Evergreen President George Bridges led the commemoration, joined by elected officials, tribal representatives, community leaders, students, alumni, and the public. Gov. Jay Inslee’s proclamation declaring March 21, 2017 Founding Day. 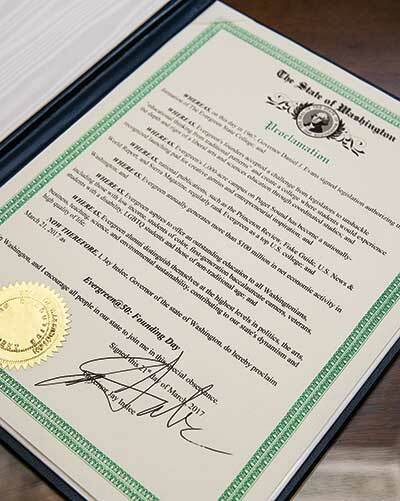 Inslee signed a proclamation recognizing the founding of Evergreen, noting that Greeners distinguish themselves at the highest levels in politics, the arts, business, teaching, science, and environmental sustainability. The proclamation also stated that Evergreen is a nationally recognized launching pad for creative genius, civic engagement, and entrepreneurial inspiration, contributing to Washington’s dynamism and high-quality of life. 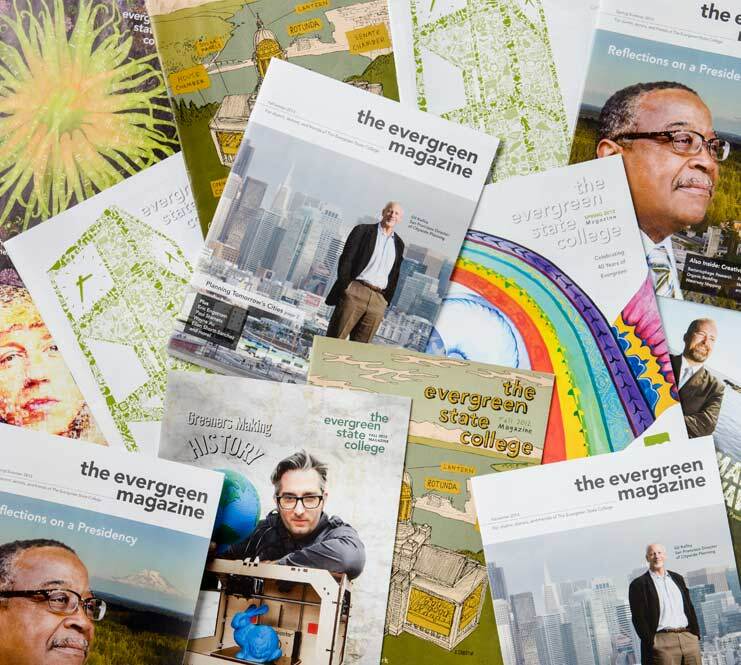 Bridges spoke about the college’s vision for the next 50 years, highlighting “a future where Evergreen continues to act as an engine for economic, creative and social entrepreneurship, for our region, state, and nation. We are looking for new ways to expand what we already do well: produce employment-ready graduates, who have the skills to adapt and thrive in a 21st-century economy,” said Bridges. 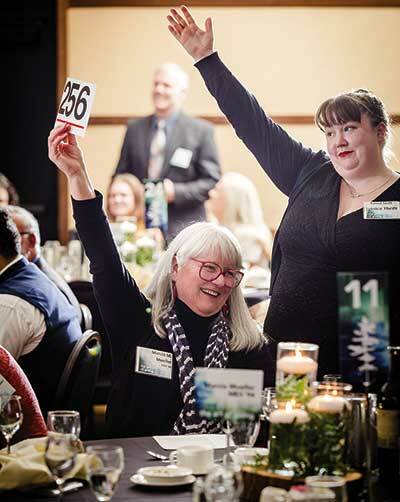 Marcia Mueller MES ’94 has fun bidding with Evergreen staff Jessica Thrift at The Art of Giving 2017. The Evergreen State College Foundation’s annual Art of Giving Gala and Auction raised a record-breaking amount—more than $200,000 for scholarships at Evergreen—surpassing their goal of $155,000. The Art of Giving is the foundation’s largest annual fundraiser, benefiting scholarships and educational opportunities for Evergreen students across Olympia, Tacoma, and Western Washington. As a featured speaker, U.S. Congressman Denny Heck ’73, inspired guests with his observations on national politics, while master of ceremonies and Univision anchor Jaime Méndez ’95, and auctioneer Laura Michalek kept the night rolling. The event secured funds through popular auction items such as an 18-course organic farm dinner, vacation home getaways, and student-donated art. An opportunity to raise the paddle this year bolstered an emergency scholarship fund for students who need to pay for car repairs, incur unexpected medical expenses, or face other unanticipated financial burdens. Generous donors dug deep to support this vital work. After eight years of overseeing millions of acres of Washington state forests, waterways, and agricultural lands, former Washington State Commissioner of Public Lands Peter Goldmark is now at Evergreen, preparing the next generation of environmental leaders to take the helm. A molecular biologist and organic farmer, Goldmark is teaching Environmental Leadership this summer for the Master of Environmental Studies program. In the fall, he’ll teach Public Land Management and Climate Change. 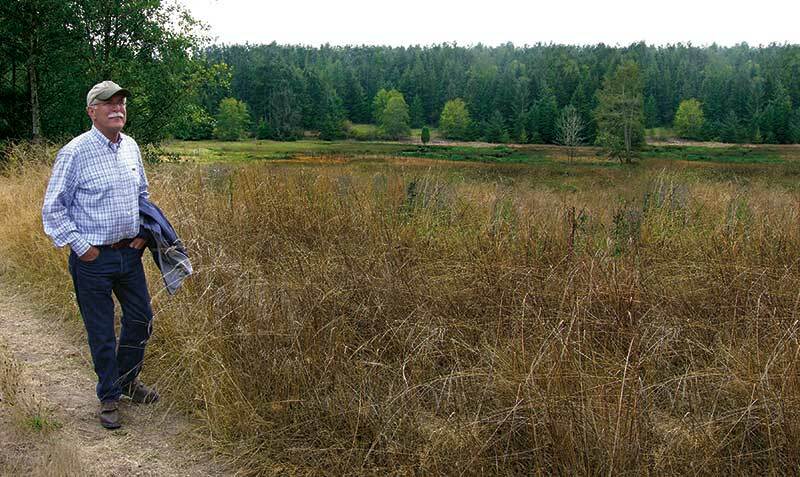 Peter Goldmark walks through the Cypress Island Natural Resource Conservation Area, which protects one of the last undeveloped islands in the San Juans. Drawing on his experience in protecting the aquatic bedlands of Hood Canal, blocking a proposed coal terminal off Puget Sound’s Cherry Point, and creating the state’s first-ever community forest from 50,000 acres in Kittitas County, Goldmark plans to map different routes and tactics used by successful leaders to conserve and protect natural resources. The courses will feature guests presenters from grassroots organizations, tribes, federal, and state agencies, the Washington Legislature, and the media. Students will examine environmental case studies from around the state, analyzing the leadership decisions that helped shape solutions.